This is a little piece on how I personally make choices in character design, using my latest Heromachine thing, Apatite, as an example. I’m not a professional and these are only my uneducated opinions, but maybe they can help you as well? HM3: Hey, bud! Would ya like to buy some leftovers?! Hi guys, JR here with the formal announcement of this years Creators Club Poster. This years poster is being done by Stulte and the theme is Magic. So what you guys need to do is create a self portrait of yourself, either realistic or idealised, as some form of Fantasy based magic user, be it Witch, Wizard, Mage or other. You can show magic use if you wish and use poses other than the standard base pose, however we must insist on a few things. 1. The character must be forward facing, 2. Faces must be visible, so no masks or face coverings please, and 3. No backgrounds. Shading is optional, so you don't have to shade if you don't want to. And obviously all entries must be full-body pictures. Of course, as with all previous CCP's, for your entry to be acceptable you must complete the following criteria. If you don’t then you don’t get on the poster. 1. Your entry must be in .png format. You must title it in standard contest entry style i.e. Username- Creators Club Poster (for example I would title mine JR19759- Creators Club Poster). Don’t screenshot the picture and send that in, export it as a .png please. 2. You MUST include the text for your entry. Mandatory. This is incase Stulte needs to re-export any of the files in a bigger or smaller format. You can include it as an attachment in the email or just paste it into the email, but you have to have the text accessible. 3. Your email has to be titled something applicable to the Creators Club, so its easy to recognise as not-spam. 4. You only have one entry, so make sure you’re happy with it before you send it in. It doesn’t have to be the worlds best creation, this is only for fun after all, but we don’t want endless revisions. After you've done that, send your entry to Stulte at creatorsclub2016@gmail.com . Submissions will be open until Feb 1st as of today, so you've got a whole month to do your entries, just don't leave it to the last minute and not give yourself enough time. This is open to everyone, so you don't have to be especially prolific or a Power User or anything, just a part of the community. And remember, this isn't a challenge or anything, so just have fun with it. If you have any questions, just leave them in the comments and Stulte and myself will try to answer them as best we can. If Stulte has anything else to add, I'm sure he'll do so in the comments as well. But with that, I look forward to seeing what everyone comes up with. Hey guys, JR here. As with this year, I'm now looking for someone to do next years Creators Club Poster, starting in January and hopefully being finished in February. For those of you who aren’t in the know, the Creators Club poster is a community project where one of the members of the community (previously myself, MadJack Atomic Punk and Hammerknight) have come up with a theme for everyone to follow (Superheroes, Men In Black, Chibi’s and Westerns), and then people create a self-portrait of themselves fitting to that theme. All of the self-portraits are then sent to the organiser, who then puts them all together in one big poster that showcases the community that year. It’s not a challenge, it’s just a bit of fun, you don’t have to be a Power User to participate, you just have to use the site and follow the submission rules for the poster. Now, obviously, we're trying to get new people to do these each year, so if you would like to volunteer and you have an idea for a theme, email it to me at the usual address (it's in my About section at the bottom of the post). Oh, and you don't have to try and make it better than MadJack's was last year, so don't worry if you don't think you can. MJ went above and beyond last year and I don't expect anyone to do that sort of craziness again. Don't ask me what happened to 2012. The Machinists have spoken and they want more tops. This week's theme is military style tops. I will be creating both a male and female version of the winning item. Feel free to make art suggestions for future polls. 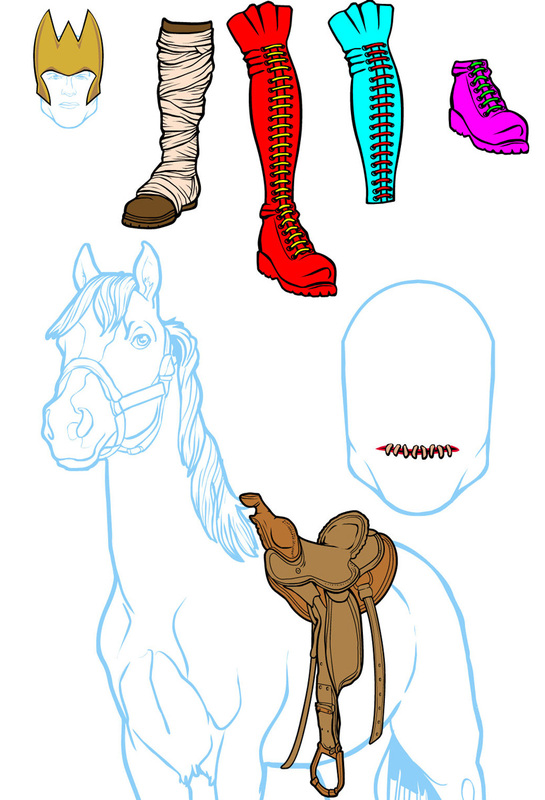 I will be doing Tops for the next poll, followed by Headgear of some sort. As some of you may know, I have considered my skills with creating normal Hair assets sub par at best. With that in mind I started thinking of ways to compensate for this weakness. I've been experimenting with resourcing hair art from existing pieces and transforming them into HeroMachine assets. My first experiment with this can be seen below. 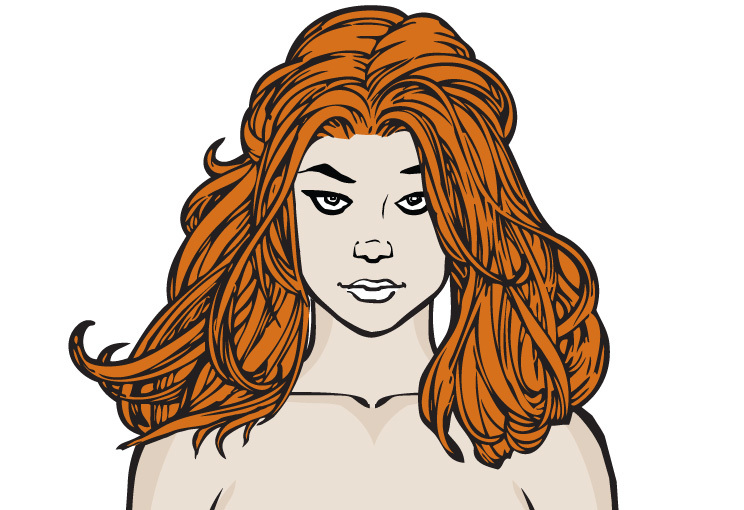 I used Sue Storm hair as a resource and created vector artwork that can be added into HeroMachine. Now the pitch. I'm asking any interested Machinists to scour the Internet for hair art that I can use as a resource for hair creation and then add to HeroMachine. For the first phase of Project Hair I would take the top 6 suggestions (either chosen by me or a poll) and add them into HeroMachine as soon as I can manage it. 1. The artwork must be black and white and created in a style that is compatible with the HeroMachine aesthetic. Essentially Comic Book style inked artwork like the Sue Storm example above. 2. Avoid hair with headgear. I just want the hair. 3. Bigger is better. If the image is too small it may be hard to see the details necessary to create the hair artwork. 4. 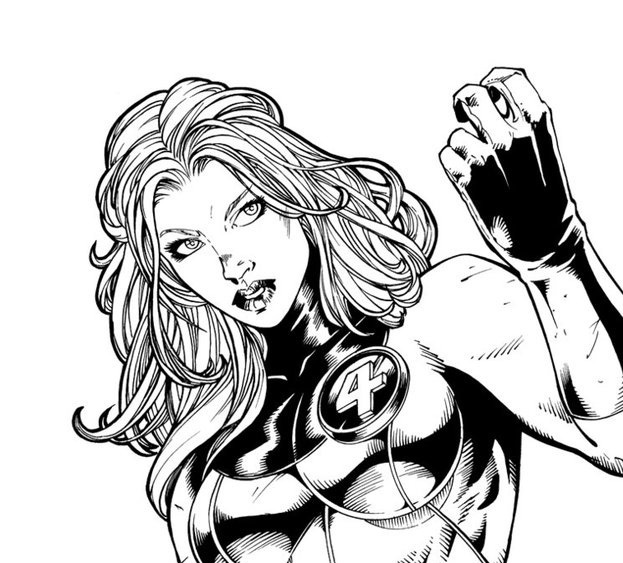 I've found inked artwork depicting heroes with lighter hair, better suited for HeroMachine adaptation. Dark hair is usually depicted with larger black areas. If we want hair with bigger, black shapes we can go that route though. Together we can make HeroMachine a whole lot hairier. Poll #2 Winner, Wrapped Boots, has gone live. I also threw in the Tall Boot as a bonus and broke it into two pieces to boot. In addition I uploaded a few other items: a Fantasy crown/helm I made for one of my own major villains, a saddle I made for SkyBandit, and a thread-stitched horror mouth in honor of the approaching Hallow's Eve. The Wrapped Boots can be found in FootRight/Standard. The Tall Boots can be found in FootRight/FemaleStandard. The helm can be found in Headgear/Fantasy. The saddle can be found in ItemsRight/Miscellaneous (I need to break it apart into a couple of pieces, so that will be updated in the future.) 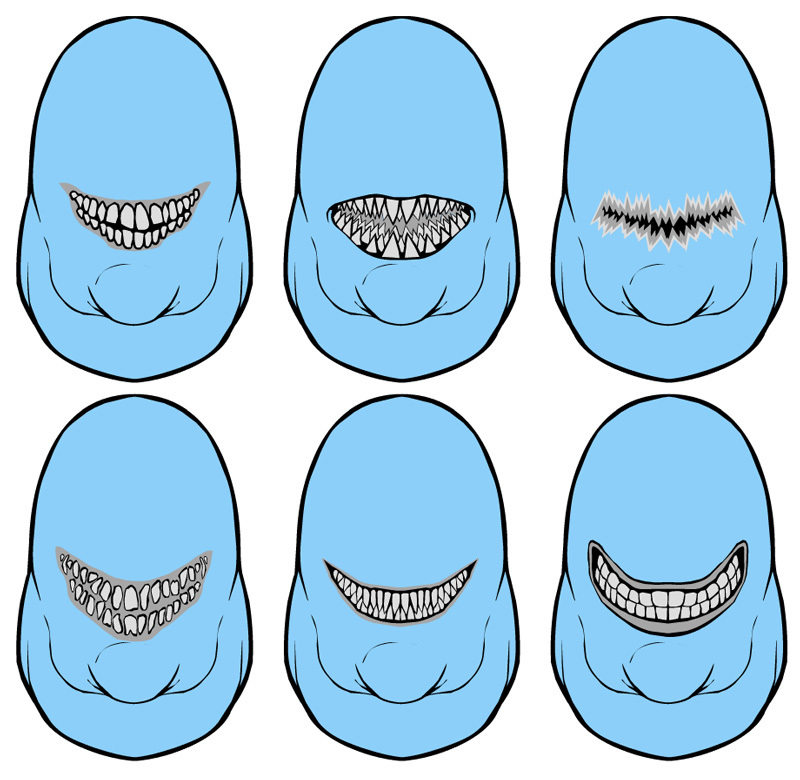 The stitched mouth can be found in Mouths/Standard. Enjoy and keep on Machining! New Item Brainstorming: What Art Assets Would You Like to See Created? Hello fellow Machinists! Choose your 5 top categories that you would like me to create art assets for. Just sitting around wondering what art assets the Machinist community would like to see added to HM3. I made this poll as a semi-formal gathering of data to gauge the interest in particular categories. I am also interested in hearing specific requests in the discussion below, with the hope of expanding upon the conversation. Ultimately I want to use this as a guide for future item polls. HM3: Right in the Kisser! I was going to do a poll on mouths earlier, but instead I just started making them. Here is a selection fit for the upcoming Halloween celebration. You can find them all in Mouth/Standard. Time for another poll! This time we have some boots. Walk on over and tell me which of these pieces of footwear you would like to see kicking around the Machine. I will put my best foot forward and try to create them to your satisfaction. We've got the new Wonder Woman boots from the upcoming Batman Vs. Superman movie. Some tall black boots that AMS suggested. Some cloth-wrapped boots that may or may not have been from a Star Wars property. The poll is closed and the winner is Cloth-Wrapped Boot! I will create this asset and add it to HeroMachine over the next week. The poll will close at Midnight on Tuesday, October 13th.